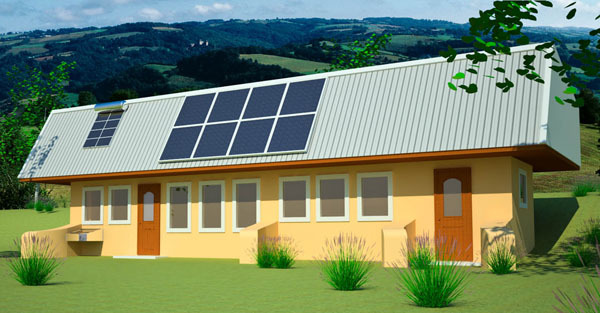 Zero Energy One is a major step forward in sustainable housing. This revolutionary design features zero net energy use, extremely low 'near zero' embodied energy and extremely low cost. This design is the result of years of research in energy efficiency and low cost, alternative building methods. 846 sq. 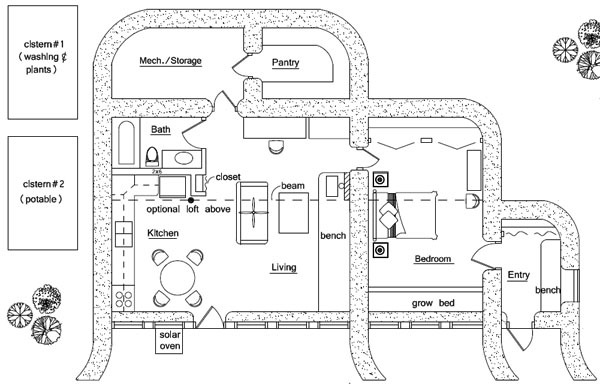 ft. interior, 1 bedroom, 1 bath; footprint: 36' x 48' not including cisterns. 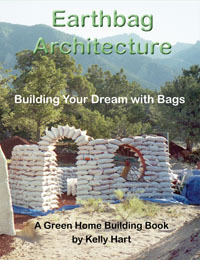 Near zero embodied energy construction when built with earthbags using recycled grain bags and other recycled materials, earth, gravel, scoria, earthen floors, earthen interior plaster, lime exterior plaster, pallet wood trusses (non-code building areas, otherwise factory trusses), rice hull roof insulation, recycled content metal roofing. Ultra-low cost can be attained with earthbag construction, recycled and locally obtained non-toxic natural materials, and owner-built with low tech solutions.